Any diapointments with this Fiat? Too many repairs, etc.? I have had my 2013 500 sport for 3 years and 35K miles. The only issues i have had in that time have been to replace the rear rotors and brake pads, and replacing the tires at 24K. Otherwise, just oil changes, wiper blades, and spark plugs at 30K. Car has been 100% reliable for me. No disappointments at all, car has been superb. I would buy another, but not brand new. Depreciation is BRUTAL. Of course, that makes them a great value when you find a low mileage used one. much greater than all but the largest SUV, wagons, trucks... and the Fiat is easy to park, has a tight turning radius, and gets very good gas mileage (I settled into an average of about 32mpg - when new, I drove very carefully to attain 36+ averaged, but that got boring). Drive it like you stole it and you can expect low 30's mpg. It's my commuter car, run to the store car, carry home Costco mega-groceries for the month car, and a second home to my 80lb Boxer dog, Thor. With seats down, he has plenty room to enjoy the ride. I've gone through two sets of tires, and had all services done at the dealer... until the warranty expired (went past 50k miles). After that, I've done oil changes and tune ups. The 64k mile tuneup was new spark plugs, air filter, and an oil change. Cost me less than 50 dollars for parts and took a couple casual hours to do. Filters and plugs are easy to get to. Tons of youtube how-to videos for the DIY person. I replaced bulbs in the rear and head lights. These are well designed and easy to replace. Lamps are cheap and available at any parts store. A recall was issued for manual transmissions. It's something about clutch travel. I've yet to have a problem with it but Fiat sent out a letter informing all owners that Fiat will do a proactive service on the clutch at Fiats's expense. Dealers are waiting for the parts from Fiat, as this is a new service bulletin. 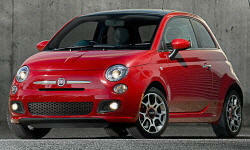 Overall, Fiat 500 pop has been reliable, easy to own and live with, easy on the wallet and easy on the eyes. A solid commuter and run-about. And it's Italian, motor built in Detroit, assembled in Mexico (for the North/South American models). It's truly a world car, found in every developed country and many developing countris too. It's good value. Yes , it's a machine and requires maintenance. At some point the clutch will wear out, brakes and more tires. I foresee it being a durable little car. I've had my 2016 Pop for 1,050 miles and I have been to the dealer three times. Twice for O2 sensors and once because there are a half a dozen spots of bare metal on the body. I have not heard back from Chrysler on how they plan to fix the paint. Chrysler has resolved all issues to my satisfaction. I'm very happy with the car.